Depending on the day’s conditions, the two best sites are selected from 21 premier outer reef locations. 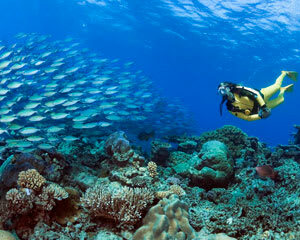 Your expectations will be surpassed as you encounter a vast diversity of marine life. Take the plunge and enter the incredible world of SCUBA diving at one of the worlds most famous diving locations - The Great Barrier Reef. Before you get in the water a SCUBA instructor will show you all the equipment you need and talk you through how it works. Once you're comfortable and understand how everything works it's time to get into the gear and take the plunge into the big blue! Once you're used to this new found skill of being able to breathe under water your instructor will take you exploring the wonders of the Great Barrier Reef where you can expect to see incredible corals, all manner of fish and possibly some turtles as well! Nothing more to pay on the day! Your $10 Reef Levy is included in the price. Return transfers can be arranged from Cairns hotels available for an additional cost. Book now to discover the Great Barrier Reef.